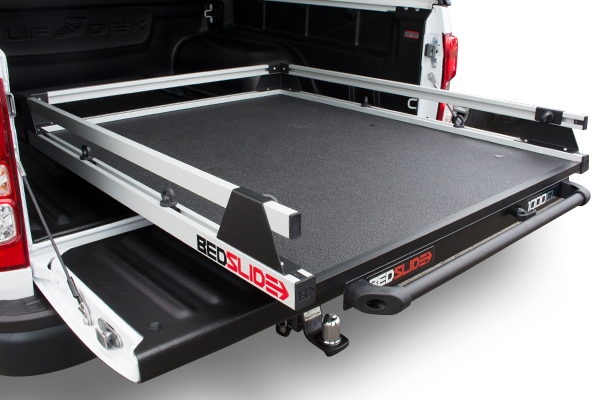 Bed Slide converts the ute tray into a giant half tonne drawer that makes reaching for gear comfortable and effortless. Built from 100% weather resistant materials this hard-wearing sliding drawer system is built to withstand whatever it is loaded with. Taking on a maximum 450kg load a simple latch locking system allows it to be effortlessly slid out, no matter the weight of the load or the strength of the user. The low profile design keeps it slightly above the height of the tailgate for convenient reach while low enough to remain functional under a hard lid or canopy. Capable of being fitted with cargo rails and storage bins, Bed Slide can dedicate space for tools and access more tie-down points to secure more expensive and fragile items. • Effortless sliding and locking system. • Made with 100% weather-resistant and heavy-duty materials. • Customisable with cargo rails and storage bins. • Easy install and removes in minutes. * Image includes optional Guard Rail Kit.